Well-defined, stable cationic species can be prepared by stoichiometric substitution of one chloro ligand in the parent, neutral W-oxo-alkylidene-NHC complexes with Ag(MeCN)2B(ArF)4 or NaB(ArF)4; B(ArF)4 = B(3,5-(CF3)2-C6H3)4. 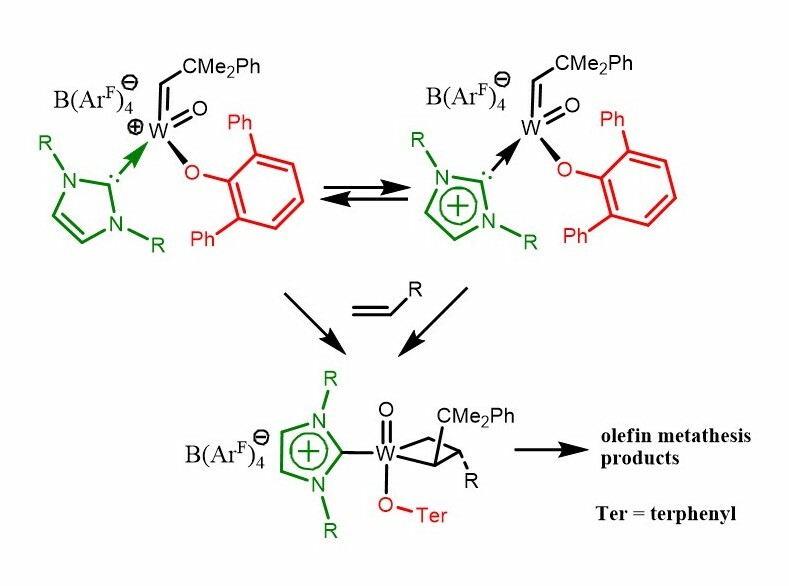 They are highly active olefin metathesis catalysts, allowing for turnover numbers (TONs) up to 10,000 in various olefin metathesis reac-tions including alkenes bearing nitrile, sec-amine and thioether groups. Buchmeiser et al. Journal of the American Chemical Society 137, no. 19 (2015): 6188-6191.